Ninja Loan - What Does It Mean? What is a "ninja loan"? 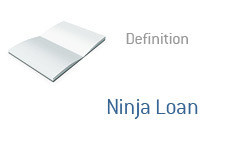 What is the definition of a "ninja loan"? "Ninja loans" were popularized during the real estate boom that took place between 2001 and 2006 in the United States. It means that the applicant had to show no proof of their income, job or assets. Instead, only the credit rating of the applicant and any history of paying back mortgages were necessary to be verified for the application. So - you have good credit? Just tell us what your job is, what your income is and what your assets are, and we'll believe you without needing to verify. You are a lawyer that makes $250,000 a year? That's great - as long as you have a strong credit score, we'll approve your mortgage. No need to show us any pay stubs or bank statements or income tax statement to verify your income. "Ninja loans", like many other types of no-documentation and low-documentation lows that were popularized during the real estate boom, have gone the way of the dodo bird as credit has significantly tightened over the past 2-3 years. Now you might have to actually prove that you are a lawyer or a doctor or that you make $300k a year.